*This article has been updated in 2018. While at the gym over a year ago, I caught a small part of the World Cup game between Uruguay and England. Within a few minutes, I witnessed Alavaro Pereira take a knee to the face and was knocked out cold. Did they rush him to get medical help and reduce inflammation? No, they let him back in the game. This isn’t a “walk it off” scenario and there’s a lot of hoopla going on right now condemning those in charge for allowing this and other similar examples in sports across the board. TBI is the leading cause of death in individuals under the age of 45 years, with an estimated incidence of death reported as 20–30 per 100,000. The majority of TBI cases can be attributed to motor vehicle accidents, motorcycle accidents, bicycle accidents, and pedestrian injuries. It is also a major concern in football, rugby, soccer, lacrosse, baseball and ice hockey – where there have been major increases in concussions. According to the CDC, a number of kids coming into the ER with brain injuries went from 153,000 in 2001 to 250,000 in 2009; a 60 percent increase. In football and hockey, the number of actual concussions is six or seven times higher than the number diagnosed. Approximately 70 percent of football players and 62 percent of soccer players get at least one concussion per year. In a study of Norwegian soccer players, 81 percent had an impairment of attention, concentration, memory, and judgment ranging from mild to severe. A new study from the Archives of Pediatrics & Adolescent Medicine found that children who suffer concussions may experience lingering problems with memory and attention, even 12 months after the injury. The New York Times reported that 30 percent of concussions are from football in teenagers between 15-19. The NFL has taken steps to reduce the number of head injuries and is raising awareness due to multiple football players speaking out. What are the Repercussions of Getting Concussions? While often there are no immediate symptoms with a concussion and nothing irregular shows up on the CT scan or the MRI, subtle changes occur. Over a period of a few weeks or even months, the individual may become tearful, angry or irritable; have trouble thinking clearly or concentrating; or suffer from headaches, confusion blurred vision memory loss or nausea. There may be personality changes, temper problems, dark thoughts, and difficulty expressing emotions or understanding others. Despite the technological advances made during the last several decades, there still is no effective neuroprotective therapy currently available for mild let alone severe traumatic brain injuries. The mainstay of treatment for patients with concussions is rest and while the majority of patients have a spontaneous resolution of their symptoms over a short period of time, approximately 10-20% of patients will have persistent symptoms. That percentage is too high for having persistent symptoms. Another study found that neck strength predicts concussion risk. Biomechanic researchers have suspected that girls have a higher concussion rate than boys in sports like soccer and lacrosse due to differences in neck strength. If your neck is weak, then concussions are more likely because your head will shake more on impact, causing the brain to slam against the skull. Research has backed this claim up and found that for every one pound increase in neck strength, odds of concussion fell by 5 percent. While for some this may not be anything new, but if your neck is lacking in girth, give it more focus. University of Buffalo researchers published a study in the Clinical Journal of Sports Medicine, that individualized exercise programs just below the onset of symptoms is safe and can relieve nearly all post-concussion symptoms. “The results counter the accepted wisdom that PCS should be treated with rest, reassurance and antidepressants and that physical activity should be avoided.” The athletes who exercised returned to normal within 11 to 36 days, while those who did not exercise required 41 to 112 days of intervention. Increasing evidence has shown that APOE-?4 genotype is associated with poorer outcomes following a traumatic brain injury, likely due to the reduced ability to repair synapses and protect neurons from injury. TBI’s are associated with increased risk of Alzheimer’s disease. Therefore, the E4 genotype may be useful to know if you are at a higher risk and what you need to do to be pro-active for protection and repair in sports or activities with a higher percentage of head injuries. 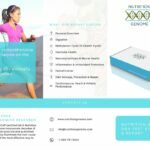 You can find out your APOE genotype through Nutrition Genome. We need to start focusing on what we can do to bolster protection and repair once a concussion has occurred to lower the overall effect. The recommendations of rest and Ibuprofen are not enough; we need to start utilizing nutrients for concussions that have been proven to work in studies. Currently, we can take what we know about inflammation and trauma to the brain and apply it to concussions, and start looking into what supplements can help reduce the damage of concussions. Certain compounds with multiple mechanisms of neuroprotection and anti-inflammatory properties can be applied. According to Dr. David A. Honda, the director of the Brain Injury Research Center at UCLA, recovery depends not only on the severity of the blow but also on how many previous concussions a person has suffered. Once a person has suffered a concussion, he or she is as much as four times more likely to sustain a second one. What are the best supplements for concussions? Inflammation control, blood vessel and tissue repair are in order. Do not wait until you have a concussion to start implementing ways to protect your brain from injury. It is always easier to prevent damage than it is to repair it, and having a nutritional reservoir on hand when it occurs will help first responders of your body to work efficiently. Remember, these are suggestions based on current research and are in no way intended to take the place of the care from your physician. I recommend taking this article with you to the doctor’s office to assist in a plan. I played every sport available while growing up, and if my future kids play sports, I will be utilizing these products in a protocol for prevention and repair. Remember to choose a high-quality electrolyte drink without the harmful food dyes and sugar to stay well hydrated. 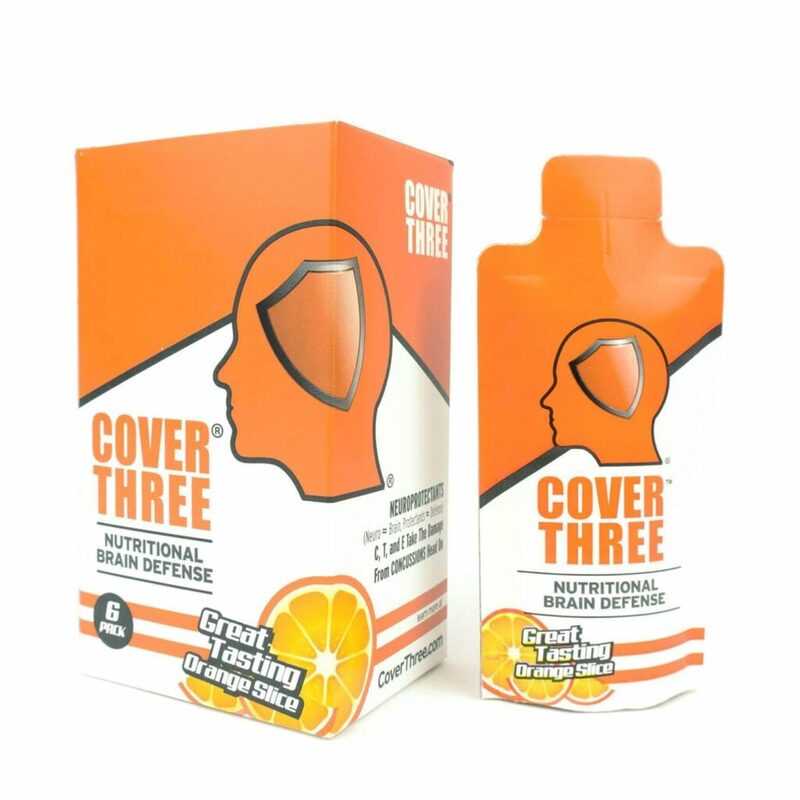 Cover Three is a product that was just launched in June 2018. It is a unique and superior formula created by a doctor that played football at Brown University and is designed to take as a preventative and recovery aid if a concussion occurs. This product allows you to get the benefits of multiple nutrients needed for injury prevention and repair that would require numerous expensive products. The taste is excellent in the gel form and sweetened with monk fruit, making it easier for teen athletes to consistently use. Concussions require tissue repair and anti-inflammatory intervention. “One implication of the study is that concussions, such as those that occur in football, may be best treated with immediate high-dose fish oil supplementation to reduce brain inflammation. The same may hold true of all brain trauma patients,” Sears said. In fact, Dr. Sears has had success 7 out of 7 times with high dose fish oil and TBI’s. You can read one of the success stories from this CNN article. In this case, a 20-gram dosage was given under a doctor’s care for 48 hours. How About Fish Oil’s Ability to Provide Preventative Protection Against Concussions? Other studies have found utilizing rodent models of experimental injury have shown that pre-injury dietary supplementation with fish oil effectively reduces post-traumatic elevations in protein oxidation resulting in stabilization of multiple molecular mediators of learning, memory, cellular energy homeostasis and mitochondrial calcium homeostasis as well as improving cognitive performance. The benefits of pre-traumatic DHA supplementation have not only been independently confirmed, but DHA supplementation has been shown to significantly reduce the number of swollen, disconnected and injured axons when administered following traumatic brain injury. Of note, DHA has provided neuroprotection in experimental models of both focal and diffuse traumatic brain injury. Preclinical studies have suggested that pre-traumatic and post-traumatic curcumin (from the spice turmeric) supplementation may bolster the brain’s resilience to injury and serve as a valuable therapeutic option. These studies demonstrated that both pre- and post-traumatic curcumin administration resulted in a significant reduction of neuroinflammation. Resveratrol has been demonstrated to effectively cross the blood-brain barrier, increase cerebral blood flow, reduce inflammation and improve outcomes in animal models following multiple acute neurological traumas. Resveratrol treatment in immature rodents reduced post-traumatic neuronal loss and improved behavioral measures of locomotion, anxiety, and novel object recognition memory. Studies show that brain magnesium levels fall 50% for 5 days after injury to the CNS. Low magnesium levels facilitate secondary injury processes including inflammation, excitotoxicity, mitochondrial dysfunction, energy failure, edema formation, free radical production, and apoptosis, among others. When magnesium levels are significantly decreased after trauma, the cells are less capable of providing sufficient energy for repair and restoration; events that may result in cell death. Post-traumatic administration of magnesium to restore normal magnesium homeostasis reduces neuronal cell death and increases the likelihood of recovery. Studies of both animal and human brain trauma victims suggest higher magnesium levels are associated with better recovery. The majority of people are magnesium deficient to begin with. The brain consumes a disproportionate amount of the body’s oxygen as it derives its energy almost exclusively from oxidative metabolism. Current studies suggest that oxidative stress lasts at least 24 hours after a traumatic brain injury and that antioxidant reserves like vitamin C are severely compromised, however, vitamin E received a zero net loss in rats. Vitamin C has a short half-life, and the supply is needed to be continually refilled, especially during injury and illness. Flavonoids also play an important role in controlling the inflammatory process. Amount: 500mg-3000mg depending on age and weight in two doses daily, and may require hourly dosing (100mg-1000mg) after injury. TBI patients have increased urinary zinc losses and acutely reduced serum zinc levels. Human clinical data suggest that supplemental zinc can be used during recovery to improve cognitive and behavioral deficits associated with brain injury. Additionally, pre-clinical models suggest that zinc may increase resilience to traumatic brain injury, making it potentially useful in populations at risk for injury. It would appear that this is especially true for injuries to the temporal lobe. Melatonin is released by the pineal gland when it gets dark, inducing sleep. Researchers have paying more attention to its role in concussion recovery that looks very promising for chronic headaches and poor sleep patterns. Protecting the mitochondria in brain cells is a major focus for brain injuries. Melatonin is a powerful antioxidant that concentrated in the mitochondria of the cell – especially brain mitochondria – making it neuroprotective. Melatonin has been evaluated to be effective in TBI where it improves mood and behavior, decreases brain edema, decreases intracranial pressure and significantly increased superoxide dismutase and glutathione peroxidase (both reduce inflammation). Acetylcholine is the neurotransmitter of the vagus nerve, which enervates numerous organs. The vagus nerve also is connected to the brain stem, as seen here. Acetylcholine requires adequate choline to function correctly. Choline is connected to lower anxiety levels, plays an important role in cell membrane health, and improving memory. A study using a rat model found that dietary choline supplementation resulted in a modest degree of improvement in spatial memory as assessed in the Morris water maze test. In addition, choline treatment resulted in significant cortical tissue sparing, reduced brain inflammation, and normalized some TBI-induced deficits in nAChR expression. If an injury has occurred to the temporal lobe and memory is affected, it would stand to reason that choline supplementation should be used. Studies have found that Branch Chain Amino Acids (BCAA’s) have increased recovery after traumatic brain injuries. One study found significant reductions were seen in the concentration of branched chain amino acids (BCAAs) after a TBI. Dietary consumption of BCAAs restored hippocampal BCAA concentrations to normal, reversed injury-induced shifts in net synaptic efficacy, and led to a reinstatement of cognitive performance after concussive brain injury. All brain-injured mice that consumed BCAAs demonstrated cognitive improvement with a simultaneous restoration in net synaptic efficacy. Promix is a grass-fed whey concentrate for 5 lbs. and 76 servings at $79.99. That is $1.05 per serving. Compare that to other grass-fed whey protein powders that are 1-2 lbs. and may cost twice that much per serving. See a full analysis of whey protein powders here. Animal TBI models have demonstrated that nicotinaminde (B3 niacin) yielded beneficial effects including reduced cortical damage, inflammation, and behavioral disruption in animals receiving infusions. It would stand to reason that B12, folate, B2 (riboflavin) and B6 would also be crucial, since they are all involved in neurotransmitter synthesis in the brain and controlling inflammation from preventing elevated homocysteine and high nitric oxide levels. Vitamin D supplementation and the prevention of vitamin D deficiency may serve valuable roles in the treatment of TBI. Vitamin D deficiency may increase inflammatory damage and behavioral impairment following experimental injury. Maintain your vitamin D levels between 40ng/ml and 50ng/ml with blood tests every six months. If you are very low in vitamin D, you will need to supplement with higher amounts of Vitamin D to boost levels. Lion’s Mane is a mushroom that caught my attention while reading research showing that the hot water extract stimulates the Nerve Growth Factor (part of a family of similar proteins that serve to promote the health and normal function of the brain and nervous system) and accelerates the growth of the myelin sheath. After a concussion, significant damage is done to the myelin sheath of the nerve leading to the brain cell. Regenerating the myelin sheath is a crucial step towards recovery and preventing damage. One study found that neuronal excitability from glutamic acid (glutamate levels are elevated after an injury) appears to be attenuated in the presence of Lion’s Mane. There are also fatty acids in Lion’s Mane that are believed to be responsible for enhancing cognitive function. More research is needed for Lion’s Mane which appears to have amazing potential. Amount: 2000mg-3000mg in two doses. You want a hot water and alcohol extract of lion’s mane. Green Tea Extract: Green Tea contains a flavanoid called EGCG, the amino acid theanine and methylxanthine. All have been found in vitro and in vivo to have neuroprotective effects including protection from excitotoxic injury and inhibiting inflammation. This product also contains phosphatidylcholine. Wish I had known this after my concussion. you may want to consider including the triad of B vitamins (B12,B6 AND folate) that have been implicated in cognitive performance!! Thank you for such great research and information on the nutritional support critical in recovering from concussions (Traumatic Brain Injuries TBI)! Alex, I am excited about exploring adding to my regiment the astaxanthin, Lion’s Mane, and curcumin (from the spice turmeric). For further information regarding the Shaklee products, please visit my website. Wow,I didn’t realize how much nutrition plays a part in recovering from brain injury! Remember whole foods have tremendous healing powers ,. Hippocrates said ” let food be thy medicine and medicine be thy food “. Also remember the [ Doctrine of Signature ] that states any food that” looks” like an organ of the body directly benefits that organ . So with that in mind asparagus the” tips” look like the brains and are great for brain injuries. Check out my site you might like It [ foundation of nutrition the bible] . Google it . I wish I could provide you with that kind of information, but unfortunately, that is better suited for your doctor. If you have had severe nausea from 15 types of supplements, it would be hard to provide you with an alternative. Based on the mechanism of action of amitriptyline, I would ask your doctor about melatonin as a possible alternative if you want to stop using it. HI, I have bad allergies (fish, pork, eggs, gluten, …) and I have have taken coenzyme q10 regularly 100 mg/day. AFter a concussion 3 months ago, I started upping the dosage by neurologist request to 100mg 3 x / day. neurologist also recommended acupuncture, massage and physio. I have used all three in first three months when I had benefits. Because this is my second or more bad concussion, I will take 100 mg with breakfast and lunch and 200 at supper. I am not allergic to CoQ10 ubiqinol and I think that with a green juice (spinach, ginger, celery, cucumber, carrots and lemon for vitamin B) will help a lot. TO get off the other mess, follow docs orders to do it slow if needed – but you can be assertive. MY neurologist said either Migrlief or CoQ10 – because of allergies, I suspect the Migrelief may be an allergen to me with feverfew in the family of renewed and I may be sensitive to that ingredient. Hope you find solutions that work. My husband had a concussion 2 years ago and it still suffering with forgetfulness, dizziness, severe eye pain and light sensitivity. Would your list of products work for this as well even though two years have passed by? The repair process can take time and since the body has a higher nutritional need to make these repairs, it is going to be beneficial at any stage to assist repair and lower inflammation. I wish your husband the best. My 6-year-year old daughter had a bad concussion to her head as a result of falling from a height 4 months ago. She has very bad nausea (made worse by eating and drinking), muscle weakness and pain in her left leg, and has banged her head a further 3 times in the last few months. How do you suggest I treat the nausea and prevent further injury? She seems to be very vulnerable. I am so sorry to hear about your daughter. That sounds awful. Have you worked with any professionals for her alignment? Tbitherapydotcom does a stem cell treatment that gave me my life back. Stem cells are the only way to fix the damage done. The body can recover and get better but new neurons are the only way to repair the damage. That said she’s young and her brain has a better ability to heal than yours or mine. I’d get her the stem cells. 2500$ and it’s in Colorado. I would take her to a sports med doctor/concussion doctor. Poor baby. Neurophysiology would be good for her. I’d give her all the supplements mentioned along with acetyl l carnitine and creatine as well. Maybe get her an mri? The leg pain kind of makes me worry that maybe she suffered some structural damage. Check out Cerebrum Health Centre in Dallas, Texas. I am not a doctor but I did have a concussion(fall down stairs). I was struggling with my recovery. After 12 weeks, I went to a chiropractor who relieved my neck and shoulder tension. This was a dramatic improvement for me as this tension caused headaches. I also use Chrome as my Internet browser. I am using an ADD-IN called darker reader. This allows me to quickly adjust the brightness and this helped a lot. I also swam a lot when the sun was not too bright. I think light exercise can help w mental function. I m back to work in my technical career and doing really well, mostly thanks to the chiropractor. I am able to more intense work out now. I also took gabapentin prescribed by my neurologist. This comes in a variety of strengths. It has come to my attention that COQ10 may be helpful for neurological recovery. Do you have any info that supports this position? I have also been using a product that combines COQ10 and Resveratrol. I recommended this product along with omega fatty acids and lecithin for a stroke recovery client. What are your thoughts? As an aside, my client recovered remarkably well! I haven’t seen a lot, but I think there is some promising research. I know that patients in diseased states are usually found to be low in CoQ10, so it makes sense to me that CoQ10 supplementation would improve recovery in many different states. Here are two that I know of: Cerebrospinal Fluid of CoQ10 in Clinical Practice and CoQ10 effects in Neurodegenerative Disease. Glad to hear your client is doing well! A fifteen year old female suffered a severe concussion. This is her first (and hopefully her last). Of the vitamins and supplements you all have listed above, which are the best for her situation? And how long should she take them for a full recovery? So sorry to hear that. The following should be monitored and approved by her physician. My recommendation would be fish oil (dosing by her doctor), vitamin C and grass-fed whey protein. She should follow an anti-inflammatory diet to support recovery (avoiding sugar and wheat especially). It is hard to determine at what point a full recovery has taken place, however the fish oil study marked 30 days as an endpoint of recovery. I would actually recommend that she follows this program while she plays sports for prevention in case it happens again, and includes a multi-vitamin to prevent any deficiencies since the brain uses many other vitamins and minerals as well. I just wanted to thank you for your article on concussions and vitamins. I’m in my early forties and suffered a concussion a few weeks back that resulted in hearing lose in my left ear, neck pain, ringing in my ear, eye issues and dizziness. (all of the typical symptoms). It’s going on the fourth week and I’m not seeing any real major improvements. An ENT specialist prescribed heavy dose of steroids, 60mg tapering dose, which I did start but after a day felt that wasn’t the right treatment or a concussion. ..not a fan of steroids. I’ve always been a big advocate of naturopathic treatments and do take quite a few vitamins because of my MS. I didn’t think of going to look for a vitamin solution until this week but in reading your recommendations it certainly seems plausible that these things could work. All of the supplements you suggested really are a no brainer and I guess I must say it’s too bad more people don’t look at natural alternative for concussions (me included). Also really didn’t consider my water intake either. I will have to go look for lion’s mane, the only supplement that I’m not aware of, though it looks promising even for any MS attacks. Again just wanted to thank you; I feel significantly more proactive after reading this article! I am so sorry to hear you are still suffering after 4 weeks. I’m glad the article helped formulate a plan. If there is anything you need researched or have questions about, please don’t hesitate to ask. Things are slowly improving which of course I’ll credit to the supplements I started taking:). Hey Alex, any recommendations on how much omega 3 I should consume for post concussion syndrome? It would depend on age, height, weight, the amount of EPA and DHA in the product being used etc. For the fish oil dosage it should be done under the care of a practitioner that has access to your health history. Hi Alex, this article is just what I was looking for. My daughter 11 is still suffering symptoms of a concussion after 3 1/2 weeks. The neurologist prescribed steroids today, and being naturally suspicious of them, I am trying to research before giving them to her. still haven’t decided on that as there isn’t much info on the web. What is your experience/knowledge with steriod treatment for a concussion? For your supplement recommendations above, would you consider all of them to be safe for children? Very, very sorry to hear she is still suffering from symptoms. We would be happy to do an analysis and work-up for her at Swanson Health Center (www.swansonhealthcenter.com). As you can understand, due to the nature of the condition I cannot give direct advice without a thorough review (diet, supplements, medication, severity of concussion, symptoms etc.) to help decide on the best course of action for reducing inflammation and healing, especially for her age. Amitriptyline 50mg has not helped over the last 6 weeks, so we are now trying Gabapentin. Any other suggestions? I am sorry to hear that your son is still struggling. The main focus needs to be on lowering inflammation while promoting the healing the process. That requires a full b-complex – especially folate, B12 and B6. Riboflavin in higher doses can be helpful with migraines, but repair and inflammation is highly dependent on the other B vitamins. The grass-fed whey protein is very important for glutathione, which is working overtime right now. Vitamin C and magnesium should also be included for tissue damage and relaxing the muscle tension. He may require a full spectrum fish oil, not just EPA and DHA. Lastly, his diet needs to be nutrient dense and low in sugar and flour based foods which deplete b-vitamins, vitamin C and minerals. It is hard to heal injuries if other deficiencies are occurring. I would run all this by the specialists first since I have limited information. Sorry to hear about your son. I would highly recommend checking out the website http://www.remindrecover.com. This product was designed with the help of some of the leading concussion specialists and doctors in the country and is specifically designed for post concussion recovery. It’s also easy to take and tastes good. I stumbled on them after a couple pretty severe concussions and would recommend to anyone. Hope that was helpful and good luck. Alex, I so wish I had this info prior to Dec 2014. My daughter plays soccer and got hit in the temple. It took about 3 months before she was symptom free. Now I she experiences headaches about 10 min post game/practice that didn’t occur before. Wondering if any of the supplements above would help reduce those? Any direction on research would be appreciated. I wish I could help your daughter, but it sounds like she should be evaluated by a doctor before making any recommendations. One tip I can give you is to make sure she is getting sufficient electrolytes during her games and practice and not getting dehydrated. My daughter got to concussions that went untreated because the doctors office said that she did not have a concussion. ( three times I took her in) Long story short they finally realized it was a concussion and through testing found out she had 2 bleeds in the center of her brain. This has been three and a half years ago. She still deals with all of the symptoms of the concussion and has had a headache that has never gone away for all this time. We have seen about 24 different doctors and health care people. We are tired and wonder if she will ever have a healthy life. We eat organic, no grains ( because she is celiac now) Any suggestions after so long of time lasp? I can only imagine what you and your family have been through. I would really like to try and help you. Please send me an email through the contact form and give me more details on what the doctors found, her age, when she developed celiac, and supplements/medications she is currently taking. I had a minor concussion the past weekend while skiing. I visited my family doctor yesterday due to the concerns of dizziness and mild headache, he simply told me that I needed some rest and would get better; he even did not check the swollen on my head. I am so glad I read the article here, and realized that I need a lot of nutrition to help my brain to recover. I am heading to the shop now. Thanks, Alex. I’m glad the article helped and I wish you a fast recovery. My name is Jane . My son was hit in the head while pitching in gym class. Someone hit a line drive into the right side of his head. This happened a year and a half ago and he hasn’t been the same since. He no longer can concentrate and has no executive function. He did start exercising consistently the last 5 weeks which has been helpful. But he is not back to his old self. I think it is anxiety and depression. What would you suggest. We have been to many doctors. That is so unfortunate to hear. 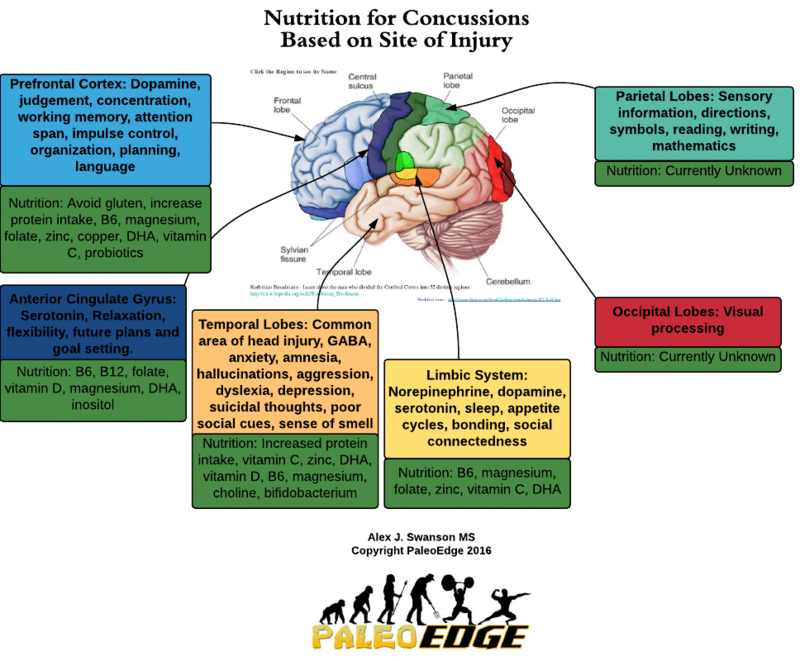 You encouraged me to create a diagram that I just added to this article to clarify which specific nutrients may be needed based on the site of the injury/behavioral changes. I also added new info about zinc. I’m not sure where you are located, but I would recommend looking into the Dr. Amen clinics, where your son would get the best care. These clinics put a special emphasis on nutrition and supplementation for brain health and recovery. I am 48 and suffered at least 2 head traumas before the age of 13. I feel even today as though I have not yet fully recovered. What supplementation protocol would you recommend to halt and reverse any recurring degeneration? Is this a month or 3 or more of supplements. How can I simplify this into something that someone who has suffered head injuries can remember to fulfill on daily? I would recommend taking this list to your physician and having him/her formulate the best plan for you. It will depend on your symptoms, health history, individual biochemistry etc. to truly be effective, and they will be in the best position to do that. My 12 year old son had a concussion in December playing basketball. Concussion put him on magnesium and B2 for 30 days. He’s back to playing sports and I was wondering what you would recommend from a preventative manner? I hope your son is doing better. For a 12 year old male who has had a concussion, I would put magnesium, zinc, fish oil and b-vitamins as the most important. I am currently looking for a good b-complex for those 12 and under since the one listed is better suited for older teens and adults. This is an old thread but I need help. My 11 year old had a. Concussion and I agree with all the supplementals listed, but she cannot have dairy…so whey doesn’t work. Any other suggestions?? Typically if people are sensitive to cow whey, they can use goat whey with success. If not, you can try the Vega Sport Performance protein powder or organic pea protein powder. The headaches come sometimes be attributed to neck strain, and a good bodyworker can help with consistent adjustments that can make a huge difference. Light exercise helps oxygen keep moving and expedites the healing process (see the paragraph and study link in the article). Magnesium is the most effective place to start for headaches and any muscle pain. Keep me updated with how he is feeling and if you need more recommendations. I am an 18yr old girl who suffered a very severe concussion that my neurologist diagnosed as a severe TBI. It was from a gymnastics accident in August 2015 in which I flew back 12ft spinning in the tuck position and rammed my body headfirst into a concrete pit covered by only a couple inches of foam, and then bounced onto a trampoline unconscious. The ER completely misdiagnosed me and sent me home when in reality I needed a thoracic spinal fusion and had a very bad concussion. I had to medically withdraw from college due to this and I am still far from healed. I have never had a day without headaches or pain. I have extreme headaches and stabbing pain, face pain, ear pain, jaw pain, finally got rid of my double vision but eye pain when I do eye exercises, balance issues, dizziness, neck pain, left arm pain, numbness, tingling, and burning down my left arm and in my face and head, rib pain, sternum pain, trouble sleeping, etc.. After 7mo the bad dreams and nightmares finally stopped, and I’ve had many dreams in which I literally feel pain. According to their cognitive exams, I am fine there.. But I scored 99th percentile and am very bright, so I do not feel that is an accurate assessment for me. I don’t remember things as well as I used to and am often confused. I’ve had a very poor medical experience with rude, careless doctors and a neurologist who told me I’d never heal. I finally got a different one, but he wants to try Botox injections into my head. I want to be cured and back to normal and would rather heal in a natural way without being stuffed with medicine. I’ve been on amitriptyline, topimirate, and duloxetine, but none have helped and they actually made my headache pain worse when I was on them. Thank you for this article though! What regimen would you recommend? That is one of the more tragic concussion stories I have heard. I can’t even begin to understand what you have been through. There are too many stories of doctors telling patients that they will never heal, and then the patient makes a complete recovery. Never underestimate your body’s ability to heal. As you can understand, it is very challenging for me to give you an accurate regiment without knowing exacty what is wrong, and where the most damage is occurring from. But it also doesn’t sound like you are getting much help. If you look at the diagram on the right of the wikipedia page, you will see a facial nerve. See how it triggers from the brain and enervates different parts of the face, ear, jaw, down the neck and elsewhere in the body? It also sounds like REM sleep may be stimulating the part of the brain where the injury is, leading to the pain during sleep and likely the nightmares. If you don’t have a brain scan, the nerve path gives us a clue. I don’t feel like I can do you justice without digging deeper. I try to answer as much as possible without suggestions for an appointment, but I think this is one of those circumstances where it is necessary. If you want set up an appointment at Swanson Health Center, I would be happy to look at everything and put together a comprehensive plan of action. I live in Illinois, so I’m not sure I’d be able to come out to California. I’ve been seeing neurologists and neuro-ophthalmologists at the Washington University Concussion Clinic in STL but I haven’t made much progress- in fact I feel worse is many ways. My ability to read without increased pain and my vision are the only two things that have really improved. We were thinking about visiting the Mayo Clinic if nothing else starts progressing soon. I recently had a cervical and sternoclavicular MRI and the only thing they found with the neck was mild degenerative desiccation signal changes in some of my vertebrae. We haven’t heard back about the chest though. I was hoping that a lot of my problems could be caused by my neck so I wouldn’t have to get those Botox injections. I do have an MRI of my brain but they said they didn’t see anything. Thank you, the more information the better. From what I’ve seen, it is often the injury to the neck that is causing lingering headaches. Yours seem to have multiple possible etiologies based on the sites of pain. Have you had any body work done for realignment? If you want to do anything by phone, feel free to reach out. I’ve been seeing an osteomyologist who is also a coach that I know and he has been great. I had an extremely inflamed vertebrae that was very painful and looked like a big lump on the back of my neck since my accident, and when I asked my spine surgeon about it he said it was just inflammation that still needs to go down.. Even a week after the accident I was worried by it and they took xrays and said everything was fine. Turns out some were out of place and the coach was working on my back and a huge pop resulted. Within mere hours the neck lump was gone! Several others have been misaligned but we are working on getting blood flow back and stretching the muscles as opposed to immediately popping them back in. I would love to consult by phone if possible! Just when I think the stories cannot be more heart breaking. I am so sorry for what you and your daughter have had to endure. It is very encouraging to hear that her brain in growing, showing the strength and resiliance of her body. I always tell people that we continually underestimate the mind and body’s ability to heal. If there is anything I can do to help, please let me know. Thanks for this, useful place to start after a concussion. I’m using music, dance, yoga, drawing, etc. along with taking the opportunity to address any ancient emotional traumas that might be more close to the surface using holotropic breathwork techniques. What do you think of the FDA’s position on these supplements? The FDA is often feels like a shill for big pharma at worst and just bad at science at best, but curious on your thoughts. Also, it would be nice if the FDA could provide studies which found negative results. As you noticed, their article comes up right above mine in Google. My impression of the FDA article is that they have a problem with a supplement company making any time of claim that their product prevents or cures concussions. A few years back, the FDA told a walnut company that they couldn’t make omega-3 health claims backed by studies because they were being “promoted for conditions that cause them to be drugs.” So it is a company making a claim on their bottle that they won’t approve of. However, like the research behind omega-3’s for cardiovascular health, the research behind specific vitamins and minerals for concussions are not false claims. What I would like to see, is for researchers to use this data for larger clinical trails and start making more progress for those who need it. My daughter has had a headache for 3.5 years ever since her 2 concussions that were not diagnosed. You asked me to email you. I had a major concussion 5 years ago and my head still hurts and I can’t function motorly or cognitively as well anymore!! Should I consider myself as having parkinsons disease? I am so sorry to hear that. That would require a doctor to diagnose. If you are able to provide more information from your doctor, I may be able to help. Hiya……I had a sudden loss of consciousness and fell hitting the back and left side of my head, my husband found me in what appeared to be a tonic-clinic seizure. I had a second seizure about an hour later. I was taken to hospital and had extensive investigations. I suffered a laceration at the occipital part of my skull that required 20 sutures. I have had numerous CTs, MRIs, Echcardiogram, and had a cardiac catherization…..all of which were relatively normal. I suffer from continuous headaches, vertigo, motor and cognitive issue and I have been referred to the TBI rehab clinic. My TBI Doctor has suggested Coenzyme Q10, Magnesium, and Vitamin B2 and I am slowing tapering off my Keppra and Ketoralac. Any suggestions….are they all on the right track? Your TBI doctor is on the right track. Have you had your homocysteine levels checked? Magnesium and riboflavin (B2) are often both used for migraines/headaches. However, folate, B6 and B12 are also important to keep inflammation down, measured by homocysteine. Magnesium works better with B6, and B12 can often help with vertigo. Zinc and fish oil may also be important for cognitive recovery. I’m so sorry to hear about your son. I’m sure he is scared and it looks like he has had good care so far. I would consult with one of the practitioners that I have linked at the bottom. Dr. Pratt and Dr. Wdowin both have the most experience with concussions. Sorry thank you for your input….much appreciated. not until the last concussion (three men beat me senseless) did i go the hospital. had i went after the very first concussion & was properly educated on the long-term effects of concussions, i would have quit drinking & sought help for my anger. this last beating lead me to become legit suicidal. crying uncontrollably. fits of absolute rage. anxiety so bad i felt like i was going into shock. i had to be hospitalized for over a week. i was prescribed lithium, cipralex & a benzo. the only thing i took when i got home was the benzo before bed. for the first few days. otherwise, i would have ended up back in the hospital. luckily i’ve gotten better (to where i don’t want to kill myself)…but everything else (the anxiety, the rage) persists. i’ve dealt with depression, anxiety, social-withdrawal, short-term memory problems, balance problems/dizziness, ringing in ears, poor sleep, etc. …for the past decade. . . and about 3-4 months ago, major bruxism. & also severe agitation. . . but this last concussion really took a lot out of me. it changed me. i am lucky to be here. i have lived a life like no other. & now i suffer. kids, don’t try this at home. it’s a living hell. Thank you for taking the time to share your experience with others and to see you are taking the steps towards recovery and a better life. I’m sure many people will come across this and be encouraged to make healhy changes in their life. A key statement you made was if you had been properly educated on the long-term effects of concussions you would have quit drinking and sought help for your anger. I agree 100% with you. Education is huge. While it may not seem like any vitamin or supplement can help you, know that there is a lot of research behind nutrition and mental health. For example, heavy alcohol consumption causes a deficiency in B1, folate, B12, vitamin C, magnesium and disrupts gut flora. All of these are tied to healthy neurotransmitters and brain function. If you are interested in reading more about the link, check out the article Mental Health Starts in the Gut, Not the Brain. I would discuss any supplementation with your doctor first. Small steps forward lead to major progress. I wish you the best in your recovery. HI Alex – thanks for the great research. My son just started college football (freshman) and got a concussion on Monday 🙁 This will be his 3rd one (first in 8th grade, 2nd in 10th grade). What would you recommend he take? The trainer instructed him rest & Advil for his headaches (has had a constant headache & is still nauseous). I want to provide him anything I can to help with the long term affects this may have on him. Thanks for your advice! I’m very sorry to hear that. I would consider Nordic Naturals fish oil I have listed (if it doesn’t affect his nausea) C-Salts vitamin C and magnesium glcyinate to use for inflammation and headaches, and to continue throughout his athletic career. 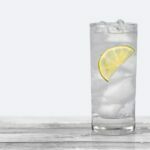 I would also consider hydrating with Gerolsteiner mineral water, which is carbonated and can help with nausea. Ginger can be helpful as well for nausea and inflammation. If you have a Whole Foods or other store that carries Kevita, they make a ginger turmeric probiotic drink that would be great. I have patented the first formula to treat concussions. The website and product is bennettschoice.com and the 60-athlete study showed a decrease in symptoms by a factor of three. That is very unfortunate to hear. That looks like a good program. The only other addition I would consider is magnesium. My daughter suffered a concussion 1 month ago. She is a 9 year old gymnast who is VERY serious in the sport. I am really getting worried that her recovery is taking so long. She has extreme set backs when she does conditioning at the gym (running mostly). This has been her only form of practice for the last month and she and I are both stressing her return to regular life. Her set backs include severe headaches (pain increases from 0 to 8-9 out of 10), dizziness, and memory loss. The dizziness and memory loss were never a part of the original symptoms. I recently started giving her Turmeric, DHA and EFA but wonder if there is anything else she can take to help the healing process. Has she had her neck examined? Dizziness and severe headaches can occur due to misalignment caused by the concussion. Her neck has not been examined. Her Dr. referred her to children’s hospital today for an MRI. Although I feel devastated that she is missing so much of her life… I know it could be a lot worse. Once she is seen by the specialist, I will ask about massage therapy and a neck exam (thanks for that suggestion). We are just ready for this nightmare to be over! I completely understand. The recovery can be a very stressful time. Yes, I think the neck could be playing a role, especially at her age. Hi Alex, would the misalignment cause dull headaches that are on and off throughout the day? She isnt complaining of pain in her neck, so should I rule that out? So far you’ve been more helpful than the Dr. so I really appreciate it. Yes, it would. There doesn’t need to be pain in the neck necessarily. Even if there isn’t a pinched nerve or a sprain, blood flow and oxygen may be compromised due to misalignment. If you have a chiropractor that uses the activation technique (which is a tool), this is usually the most effective. Thank you Alex for answering all of my questions. As I mentioned, this has been more helpful than talking to a Dr. so I apologize for being pesky. We have scheduled an appointment with the Concussion program at the local hospital, however their soonest appointment is not until the end of the year. By that time, it will 1.5 months since the original injury and my daughter is coming up on her 1st major competition (ever) mid January. She has worked so hard this entire year to prepare, so we are all hoping she can get back into the gym safely without missing her meets. One other thing I didn’t mention is that she describes a “jolt” in her head when she is upside down.. She said it feels like her head is heavy sometimes this is followed by that same dull pain. Would you recommend we see a chiropractor or sports medicine rep prior to her evaluation @ the end of the month? I would rather be productive while we wait for the appointment…than just sitting around. I am really trying to understand the signs of a deeper brain issue vs. signs caused by misalignment. No matter how much research I’m doing… I can’t fix it for her =( But I am willing to take her where she needs to go. Don’t ever worry about being pesky and there is no limit! I think it would be wise to see a chiropractor or sports medicine practitioner as well. This helps you get a consensus on the root problem. The more informed you are on the root problem, the better you will be positioned to choose the right healing path. I’m a 20 years old guy, who actually is studying enviromental engineering and I need your help :(. I was that kind of nerd, shy , kind of guy who never dit something wrong to someone and still don’t. Before 4 years I was staying outside the football field, talking with a friend of mine for my homework, when suddently I heard someone say dodge, and in a second of panic I just moved my head up the ground (1 meter) and hit a trash can ( a metal one ) in the edge, and turned my head upward. I did cut the skin in my forehead, and it started bleeding. I didnt feel dizzy , nor did I pass out, I remember what happened after and before this accident. I just remember the faces of those who laughed at me. I went to the doc. got 2 scratch stitches, and everything was fine ( the doc didnt even tell me that this was a kind of concussion ). I went home fine, ( I live in a low income country , in which even the doc. doesent care for their pacient )the next week I took 4 A-s in math , physics, psychology and phylosophy. Everything was fine, and I was told by my mom to rest, but I didnt do that because I couldnt, I went in depression due to a girl ( someone who just used me ), in that summer my aunt died, my uncle died, and I took a surgery. So after 10 months I bought my first smartphone and started staying awake helping others, and forgot about myself. I should say that I felt alone, started mastrubating I know that It wasnt the time, stayed up awake till 2 am and woke up at 7 am and started feeling a weird feeling in my head. Even with this feeling I grad. high school as the best student in my class, but this weird feeling startet haunting me, I took a year gap because I couldnt focus at uni due to this pain, and went to every single and possible doc. in my country. In the meanwhile I read about psychology, CBT and a lot of other subjects related to medicine just because I knew somethign was wrong with me. I took CT- scans , I even had a MRI this week and everything was normal. ( Just a slight sinus reoccurrence , but thats nothing ) . Now fo 3 years I have nose tingling, forehead tingling, irritability to bright light and find it hard to concentrate due to this feeling ( I even have eye floaters but the doc said everything seems to be fine, so thats not a big concern I guess) I know this isnt something inside the brain , it is outside. I went even to a psychologist and he told me you are the kindest and wisest 20 years old guy that I know, this doesnt seem to be related to anxiety. I have a question , please could it be that after I took that cut, my forehead vein is making a pressur in the trig. nerve on my face? Can I recover even 3 years after injury ? If i sleep more , eat healthy, take omega 3 , ginger and other supplements? Please help me , I dont want to live like this, my family needs me , my father is ill and cant work anymore, I need to graduate uni, Is there any possibility that I can recover not 100% but 90% or somethign near 90% because I need to graduate 🙁 ? Have any doctors considered damage to the trigeminal nerve and/or pathway? Hi doc, yes, it seems like Im all right but still deal with anxiety, could it be that Im missiing something like sleep? Nutrition? All results are turning back good. I’m not a doctor, but poor sleep and poor nutrition will both elevate anxiety. Do you have any thoughts on whether a plant seed oil – like flax – could be used instead of fish oil? It provides omega 3 as ALA, but no EPA or DHA. thanks! ALA has to be converted to EPA and DHA. This conversion isn’t very efficient and it ranges person to person. For example, when I do a genetic analysis through Nutrition Genome, I look at the FADS2 gene. Genetic variants in this gene can tell you how well this conversion is working. If you attempting to lower inflammation due to an injury (especially a concussion), I wouldn’t recommend ALA has an omega-3. My son suffered a concussion one month ago but we didn’t realize it until two weeks after it happened. He is suffering from short term memory loss, lack of concentration and anxiety from not being able to keep up at school( he is 15). The neurologist gave him some restrictions as far as sports and school but we aren’t seeing much improvement. I am going to start him on fish oil, magnesium, zinc and vitamin C and a b-complex. Will all of these help with the anxiety as well or is there something else I can add? Also, I’ve heard melatonin is good for brain healing also. Do you know about this? Yes, all of those should help with anxiety. The inflammation and excitatory effects need to be brought down. Melatonin looks promising, especially for chronic headaches and disturbed sleep. I’ve been following the research and I think it is time to add it to this article. Hi from malaysia ❣️ i want to ask what medicine / supplement good for my husband . TBI , he accident on march 2016 and remove right skull for a while .the only supplement i get nootropil piracetam 1200 mg and vitamin C 1000mg , epilim sodium valproate 200mg(5/ml perday) and he having some agresive and can’t control his behaviour .. do you have any suggestion for recovery his brain ? When aggression and anger easily occurs, it is usually due to an injury to the prefrontal cortex. This means the pathway for serotonin, dopamine, and adrenaline needs more assistance to modulate the release and response. The pathway for these neurotransmitters requires B-vitamins, magnesium, fish oil and vitamin C, with magnesium and fish oil at the right dose being potentially the most vital. These are the ones I would run by your doctor. I hope he gets better. Thanks for your reply , i very appreciate your time . its that normal to those have the same case be like that? and i really want to know, can he get his healty life ( means brain ) like before accident . and did he need to continue the Nootropil piracetam ? i that supplement good to his brain? It is very hard to predict a timeline of recovery. We do not have Piracetam in the United States, so I know very little about it. I do know that it appears to influence acetylcholine to the temporal lobe of the brain for memory. A concern I would have is how it affects glutamate receptors since glutamate is excitatory and often imbalanced after a brain injury. Hi Alex, Piracetam is readily available in the USA from several reputable suppliers as a “research compound”. Piracetam has been shown to modulate AMPA and NMDA receptors and normalize the way those receptors work with glutamate. You’ll find links to several clinical studies on Piracetam here: http://nootropicsexpert.com/piracetam/. Great article BTW on traumatic brain injury. Much appreciated. Hi alex , i’m back 🙂 do ginkgo biloba is good for my husband which is prefrontal cortex? I think ginkgo has some promising research in that area. You just want to make sure it doesn’t interact with any medications. It is fantastic to see someone like yourself take time out of your busy schedule to actually engage with those seeking some form of guidance. Thank you! I’m 29 and suffered a concussion back in Jan of 2017 (approximately 3 months ago) due to a hockey hit. The most annoying symptom, by far, has been the brain fog/lack of clarity. It feels like my mind is swimming. Do you happen to have any recommendations when it comes to a good source of non-fish Omega 3 supplement? I’m allergic to fish, shellfish, and seafood. I was also diagnosed with a B12 deficiency through blood work, and that is probably due to the fact that I’m on PPIs. I’m taking a B complex, B12, turmeric, and magnesium. Happy to do it and sorry you are still struggling after the hockey hit. Yes, Nordic Naturals makes an Algae Omega but I’m not sure if you would have a sensitivity to that as well. I’m not aware of any other supplement source of EPA and DHA. Proton Pump Inhibitors deplete B12, calcium, and more. You may want to consider sublingual methylcobalamin if you continue using a PPI. The only other option would be algae-based DHA. HI Alex, I was in a car accident and suffered a concussion on Jan 9, 2017 and am now in the post concussive phase. I have seen concussion specialists along with physical therapists (working on occipital area) as well as speech therapist to work join cognitive skills. I am having most trouble in this phase with multi tasking, fatigue and becoming overwhelmed when too much is going on at once (having a conversation in a loud restaurant setting can become overwhelming). I am taking the Nordic Naturals fish oils and Viatmin D. I have been offered the amitriptyline but I’m really trying to go the natural route, combined with therapy, to recover. My Dr did recommend Magnesium as well as Melatonin and Feverfew, however, I run very low blood pressure on a normal basis. Normal for me is 95/65. So I was very concerned about using anything that would lower my blood pressure further. I’m at the point where I feel something has ‘got to give’ here. I was a high functioning realtor and have yet to return to work. Is there anything from the above recommendations that you would recommend to help or anything I should completely stay away from if it would drastically lower blood pressure? Thank you!! As we discussed by email, I think that Dr. Pratt from the Nutrition Genome consultation page would be the next best step for you. I wish you the best! I had a very bad concussion with facial fractures about 35 years ago and lost all hearing (deafened) and sight in one eye. Developed tinnitus about 6 months after accident and it hasn’t stopped since then! I had a cochlear implant done about 8 years after being injured to regain some hearing. I have had “heavy head” and bad balance ever since. Bilateral vestibular dysfunction. No doctor ever advised me what to do afterward about helping my brain recover and most times i was sent home and told “nothing can be done to help you.” I wish i read this article back then but of course the web was in its infancy and no many had computers. I’m hanging in there in my mid 50’s and have a lil boy who’s gonna be 3 soon. he means the world to me so i gotta stay as healthy as possible the rest of the way. I pray for a cure for the things that ail me and hope to God they find a cure in the near future. Hang in there Dave! I hope the research advances in this area as well. I wish you the best. Hi Alex, my name is pamela…I’m a photographer, and while preparing for a shoot in October 2017, a 400 lb tree branch cracked on to the top of my head…I suffered 2-3 inch lacerations to my scalp, a hematoma and a severe concussion… I’m on an anxiety drug now to keep my heart from racing out of my body! I had two CT scans, and there is no brain bleed, but I am suffering from severe emotional stress… The crying episodes and sadness are overwhelming! Any suggestions on supplements I can take to help? I want an antidepressant for help, But my doctor suggested waiting it out about a month to see if my brain would heal on its own… Help? Wow, that sounds absolutely horrible to have to go through. You are lucky you to be alive! It is really difficult for me to say if any supplement would be strong enough to help modulate the emotional response. I would talk to your doctor about considering B-vitamins, magnesium, vitamin C and fish oil at appropriate doses. If anything, these may help provide some relief and expedite the recovery process. Let me know if there is any other way I can help. Good read. I tend to favor an anti-inflammatory approach myself starting with omega-3 fish oil, turmeric and green tea. Of course, your diet matters as well. Hello, I suffered a concussion after hitting my head on a table after giving blood. The hopital gave me compazine which i suffered an awful reaction to (systonic reaction) where I couldn’t control my neck or face. Since then I have been diagnosed with PCS as I suffer from tension headaches, dizzziness, sever brain fog, memeory loss, depression, anxiety, and fatigue. I have been to a neurologist and he gave my nortryptoline which. made my headaches worse, so i stopped. I tried taking Neurooptimizer but soon after taking that I suffered a sever dizzy spell. I dont know if the spell was related to this or my neck problems. I am starting vesticular occular therapy and neck strengthening exsercies soon. However, I was wondering what are some good supplements that could help releve these symptoms. I am sensitive to medications so I do not want to take anything like that. I am hopeless at this point and it is hard for me to get through my classes everyday. Man, I am so sorry to hear you are suffering like that. What an unfortunate accident. It sounds like physical therapy for your neck and alignment would be at the top of the priority list, but I have some more ideas. I’ve done some further research on head injuries and included a panel on the genetic analysis through my company Nutrition Genome. BDNF (brain-derived neurotrophic factor) really seems to be a major target gene for head injuries. When people have variants in the BDNF gene, they may have lower levels of BDNF to begin with, and therefore are more susceptible to damage from head injuries. The APOE gene is another. But a decrease in BDNF levels may account for the cognitive deficits and the impairment of memory in depression and anxiety disorders, which would occur after a head injury. Fish oil (DHA), magnesium, curcumin (I wrote about the anti-depressive effects here), and aerobic exercise (especially in the sun) have all been found to increase BDNF. Another concept that I think should start being tested is Wim Hof’s breathing method and cold therapy. You can get the instructions for free online. I have not seen anything natural that works as well for headaches and migraines then three rounds of his breathing method followed by an ice cold shower. There is research behind it for increasing epinephrine (natural pain reliever), but I’ve yet to see it tested for post-concussion syndrome. The breathing is something you would want to ease into if you get dizzy easily. I ask your neurologist if fish oil, magnesium, curcumin, daily running in the sun, and Wim Hof’s breathing method and cold showers are all safe for you to try. Don’t lose hope, there are always answers and it is about finding the right combination. Great information in this article Just wondering what you think about taking nootropics as an alternative? I think it would depend on the nootropic. Our son suffered a concussion 9/2014 in a soccer tournament. He is under the care of a fine neurologist at Mayo clinic who has diagnosed his continuing headaches since the injury as post concussive syndrome. He has also been seen by chiropractors, acupuncturist, and physical therapists. Unfortunately, his pain continues 24/7 to about a 5-6 daily and sometimes 9-10 pain level. He says he has accepted that this is his life and does not want to go through anymore tests, wearing a sephaly device on his head, and being poked and prodded. His father and I are heartbroken that he feels this is his destiny. We have gone to so many physicians and experts that I am very interested in the nutritional side of a potential recovery or at least to feel better. He is a college student now, and I feel he is not paying close attention to eating healthy. He does not take any vitamins, minerals, and his diet is high carbs and gatorade type of drinks. I am encouraged by your list of supplements and wonder by my brief introduction of him to you what you might recommend. He is also on amitriptyline and has been since the injury. Certainly a concern to me. I can only imagine how rough that has been for all of you. There is always an answer, it is just finding the right combination for the specific type of injury. Once you understand the pathways involved, you can begin to target the most important ones. Poor nutrition will absolutely affect blood sugar levels, toxicity, and inflammation, leading to more vasoconstriction and pain. I’m not sure if he would be open to what I had mentioned in a previous post regarding Wim Hoff and the breathing / cold techniques, but I would have him take a look at it. When I was younger, I had headaches for a good deal of my life almost daily. What has helped the most is avoiding blood sugar drops and spikes, exercise, 500-600mg of magnesium supplementation combined with 3000mg of vitamin C (modulates dopamine and adrenaline), hydration with electrolytes (see this article for the best ones), and if I get a headache, Wim Hoff’s deep breathing techniques followed by an ice cold shower. That last technique has eliminated a headache within 20 minutes dozens of times for me. Curcumin supplementation has also been helpful when needed. This is just an example of a combination that works for me because I know the pathways involved. If you have a neurologist that can help pinpoint the pathways involved in the pain, you can trace the nutritional co-factors and levels of specific neurotransmitters that are causing the pain. This helps you put together a plan of action. Have you had any luck? Any supplements you have found that work? My daughter is turning 13 in November, and at the end of this month she will be at 2 years of a constant headache that fluctuates from a 5 to a 10. 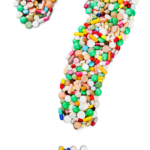 We have tried many of the doctor prescribed meds and none have worked. Along with many other dr. appts, treatments, etc. I realize this post is a year old but has anyone thought of cranial sacral therapy? It is a wonderful modality for treating whiplash/concussion.